“…and sadness falls over the land.” Lament with me friend; for our dear college football season is over. 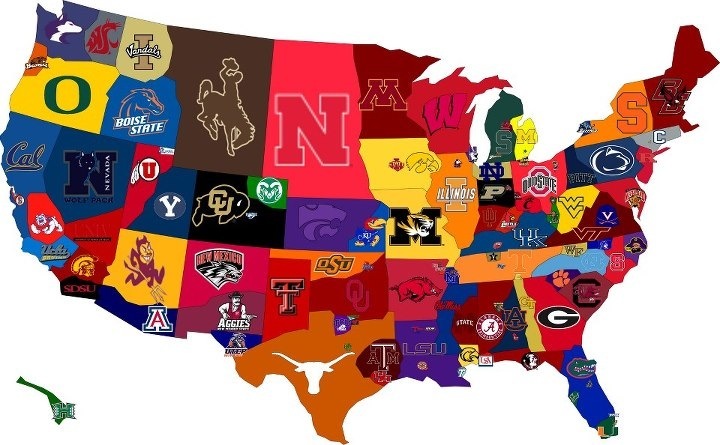 College football is everywhere. So are the passionate fans. Okay, okay, so it’s not that big of a deal! (Don’t tell that to either side of last night’s national title game. I heard the game billed as “the Golden Domers vs. the Mobile Homers,” and “the Catholics vs. the Baptists.”) But isn’t the year just a bit more fun when we’re all geared up in our favorite school colors and shouting for our team as they move a little brown ball up and down a field? And now we must wait for 8 months to renew the passions, the rivalries, the predictions and the heartbreaks. But something happened this past college football season that made me pause to consider my own priorities. Most people who know me know that I am a die-hard Georgia Bulldog fan. So when the Dawgs were invited to Orlando to play on New Year’s Day at the Capital One Bowl, I saw a chance to see my favorite team up close and personal. In the lead up to the big bowl, UGA and Nebraska players made appearances around Central Florida posing for pictures, taking in the attractions, and enjoying the spoils of a great season. However, one appearance stood out: UGA head coach Mark Richt was invited to preach…yes, preach, at First Baptist Church of Orlando. On the Sunday before the new year, Richt delivered a message to thousands gathered in attendance and many people gave their lives to Christ for the first time. And this happened in the middle of the “Dawg hating, Gator Nation” of Central Florida! Now, say what you want about college football and the various teams, but what Richt did went beyond football. Mark Richt became more than just a head coach. He became more than just blog fodder for crazed fans calling for his firing every season. He became more than an X’s and O’s guy working in the most dominant college football league. He became a voice for the greatest news ever spoken to humanity. And in so doing, he vaulted himself and his legacy far above a mere win/loss record and trophy presentation. I wonder: how many solid lovers of God want their sons and daughters to play sports for a college one day? And as I write that I wonder: how many of those same lovers of God would be willing to sacrifice conviction for the chance to just win? Please understand that I am not in any way, shape or form vilifying any other college team or coach. Nor am I saying that winning coaches don’t love Jesus. But this event forced me to rethink my passion for the game in light of my passion for the gospel! And if I was completely honest, I would admit that there are times where my passion for the gospel is not nearly as hot as my passion for my favorite college football team. Richt has consistently shown that the game is just that; a game. There’s a greater call. In fact, if my sons had the chance to play sports for a team whose coach was more interested in helping them become men of God but continually had a losing record versus a team whose coach was the greatest coach of all time because winning was the bottom line, I pray that I would have the conviction to steer them towards godliness above winning. No, last night Mark Richt did not lift the crystal football trophy above his head. He did not celebrate his team’s dominance over another on the field. He did not bark incessantly at the officials or get in to his players’ faces when they messed up. He did not even win the SEC. But something tells me that’s not his ultimate motivation. Instead, he has a bigger story to tell. He has a greater message to share. And sports? It is what it is: a pastime. May we all recognize our part in sharing that Good News above all our hobbies, jobs, and college football games.